My friend Lea and I were invited to check out Macbar in SoHo recently. This niche restaurant exclusively serves macaroni and cheese, but not the Kraft and Velveeta you grew up on, but a more gourmet style cuisine that meets the adult palate while being reminiscent of the comfort foods of childhood. The first thing I noticed as I walked in and noticed the sleek yellow furnishings that are in the shape of a macaroni noodle. Four tables line the right side of the restaurant with two screens at the front of the restaurant flashing different animations interspersed with the menu of mac and cheese concoctions featured. Next to the screens was a counter where you placed your order and then attempted to take one of the tables while waiting for your meal. I opted for the mayan chipotle mac and cheese, thinking the spiciness of the diablo chicken would mix well with the macaroni and chihuahua cheese. Lea chose to try the mac lobsta’, which combined fresh lobster, cognac, tarragon and mascarpone, and who was I to say no when I’m having dinner with a lady who wants to order the lobster. Our meals were served in plastic boxes shaped like macaroni noodles with matching plastic silverware, and when we popped them open, we were greeted with steaming hot mac and cheese. 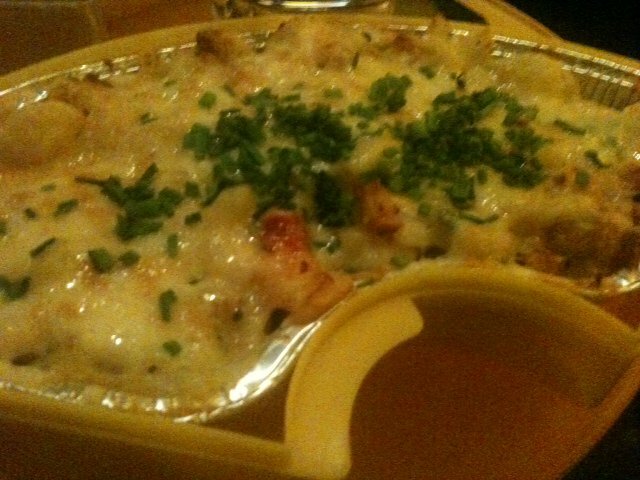 I heartily enjoyed my selection, since the spicy flavors mixed well with pasta and cheese. Lea’s mac lobsta’ on the other hand was a slight disappointment. The flavors didn’t mix quite right to us, but was quite tasty none the less. Macbar may be a small restaurant in Soho filling the niche of gourmet comfort food, but it is well worth the trip if you are a fan of macaroni and cheese. I look forward to going back there and trying their other unique macaroni and cheese creations, the maturation of the meals we all grew up on. This was a sponsored post. All above opinions are mine and are not affected in any way by any compensation received.